This week I went to see the Encaustic show Working with Wax: Contemporary Encaustic Painting in Northern California, at Santa Rosa Junior College's Art Gallery. After an inspiring talk from Mark Perlman, an SSU professor and remarkable encaustic artist, I began talking to some acquaintances at the show about my doing so many things and going in so many directions creatively that I have gotten side tracked from my love and commitment to working/playing in Encaustic. One person mentioned a teacher who once said "Beware the 10,000 Beautiful Things" That statement really touched me and I have been mulling over that statement all week, as I witness all my creative projects tugging at me like my many children calling out for attention, as I neglect them by sitting in front of the computer, looking at the beautiful inspiring art and creativity posted from all over the cyber universe. Can I find time for my one true love, or can I not shame/blame/judge myself for my lovely, affairs with other media, my quickies into others art on line, and flitting from media to media. I am working on this and am curious about other peoples ability or lack of it to focus on one thing. So if you are reading this and struggle with this challenge, let me know how you make peace with it. As an art therapist, and creativity facilitator, being able to teach, inspire and support people in many way of creative expression is a benefit, as an artist it keeps me from delving deeply into the exploration of one process and the infinite variety of ways I can explore theme. I am also pondering over the fact that using computers has made me, or rather exacerbated my tendencies towards being ADD. I used to be able to lose myself for hours in my artmaking, but now, I am lured more and more by the computer and have to set boundaries, in order to do art, read books, take walks, etc. Does anyone else feel this way, that traveling at the speed of light online, makes it more difficult to stay focused? I am concerned by this. One of the ways I have been flitting is in my mixed media art journals. So these photos are from a journal I have been working on since the holidays. For me working in this journal is a process of inviting in the muse, priming the pump, nurturing my soul, playing with possibilities without worrying about outcome or product. I just received another mandala photo from Sarah who was also in the Workshop. 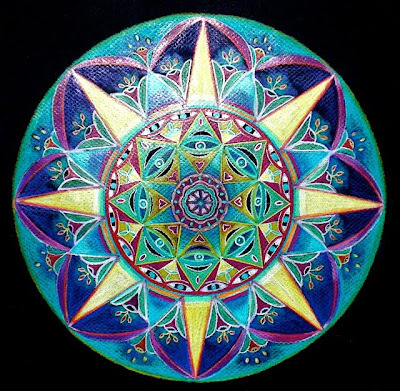 I love opening my computer and finding images of mandala's that have flown to me across cyberspace. They are each so unique and stunning. 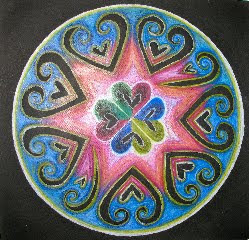 Here is Sarah's Illuminated Mandala. It reminds me of a crystalized gem of color. And while I am uploading mandala's here is the mandala that I drew finally completed as well. Enjoy your day, moment by moment, as if your life were a beautiful mandala unfolding second by second right before your eyes. Ciao. 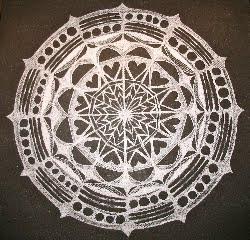 I have slowly been working on the mandala that I started at our Intention Setting Mandala Day last Sunday. I often work in bits and pieces, and the mandala process suits this way of creating very well. I realized long ago that it can be hard for me to carve unlimited time for doing art, so by leaving my work out, I am able to sit with it for 20 minutes or more at a time, and slowly allow my work to evolve. The essence emerged at the workshop and I am always amazed at how a little bit of drawing over a consistent time period grows slowly, strongly and steadily. This is where my mandala was on Sunday...I was placing my attention on balance, in many areas of my life, body, spirit, heart and mind. I realized that I wanted this to use a rainbow palette and let each one of the colors blend into the other. Letting a sense of loving acceptance surround my intentions and be what balances me as I move through my life in the coming year. I love how each color changes the energy and brings more life and vibrancy to the image. Letting the energy of compassion for self and others radiate out into the world. This is as far as I have gotten today. I look forward to finishing it soon. With a series of hopefully big rain storms coming into northern California in the next days, I will lose myself in drawing while it rains. I love to do art when its raining. 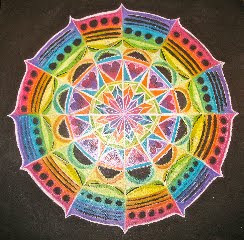 And the ongoing work on a mandala is one of the joys of life. What a wonderful way to start the New Year. MOre to come.. This past Sunday we facilitated the New Years Intention Mandala Workshop. After cleaning and re organizing the studio for a week prior to the workshop, I was pleased when all 15 participants fitted so comfortably in the space. The dreary, cloudy day was Illuminated by our sense of shared community and the deeply soothing and engaging process of creating mandalas. Even the parking of all the cars, (another detail that worried me pre workshop) went smoothly and without a hitch. The art work that emerged was stunning, and although most of us didn't finish our mandala's, they were all well on there way to completion by days end. Here are some photos of the studio, process and mandala's that emerged that day. As we begin the new year, I find myself sorting, organizing and cleaning my studio. This process allows me to put in order, make sense, review, envision, compile, release and play with what is available to me creatively. I have such abundance available to my creative self, as an art facilitator I have an abundance of supplies, gadgets, art materials, papers and paints for people to experiment, explore and play with creatively. So this is my legacy for others and my inner child. Yesterday I dropped a box of wonderful collage images, and since they were all disheveled and bent after falling and being picked up, I began to sort them according to color themes. Several years ago I was gifted by an ex student, who was a collage artist, Gloria Zuppa, of all her collage materials, since she was experiencing health difficulties that made her decide to let go of her collage supplies. She thought that I would be the one person who could share these wonderful images with many other people. Whenever I go through the images I am dumbfounded, struck by the wealth of imagery she gifted me, and hence others with. The patience, time and care that went into cutting and choosing them, is mind boggling. So this is a heartfelt thanks to Gloria, and her creative gift. My inner child delights in the gift as well, as I continue to use many of the images in my own artmaking. What a delight. So today, I have invited a few of my women friends over to spend the afternoon making art around the new year...to play, experiment, setting intentions, work on something in process or just visit. I get to share my art supplies, spend time with my friends, as well as do art in community. All of these things delight and nurture my inner child, which is one of my intentions for the new year. May all your days be filled with joy and nurturance! of all man's creative power. .